The HTC Vive Pro offers an exceptional upgrade to the original VR hardware. 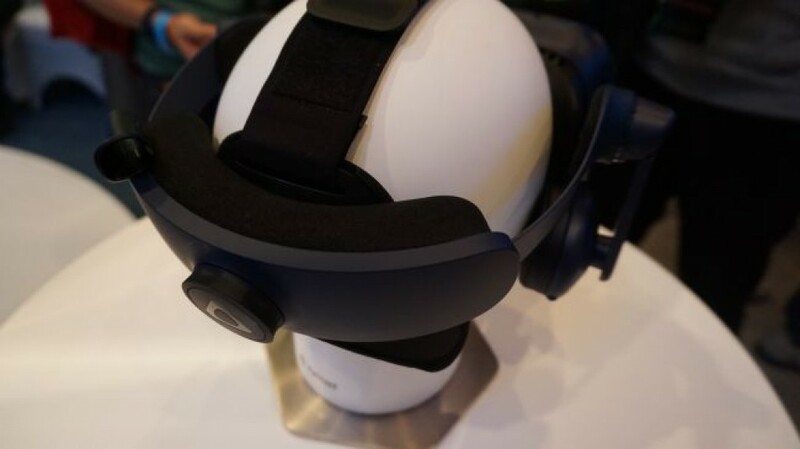 It has a higher resolution Dual OLED display, and the inclusion of the headphones help bring the Vive’s audio in line – and in some ways even further beyond – the Oculus Rift’s. We’ll have to wait on pricing details before we can make a final call on the hardware, but so far the Pro is shaping up to be the half-step upgrade the Vive needs to stay on top. Update: The HTC VIVE Pro will cost $799/£799 (about AU$1,015), HTC has announced. The price tag will only get you the updated headset, however. If you want a full package, you’ll need to buy the Lighthouse Sensors and Vive Controllers separately. HTC also announced that the headset will start shipping on April 5, 2018, and that the price of original HTC Vive will drop down a to more reasonable $499/£499 (about AU$615). HTC Vive is, in my opinion, the best virtual reality headset on the market. It was the first to offer hand tracking out of the box, and still reigns supreme as the best room-scale VR headset. The only problem is that the HTC Vive is losing its spot … to the HTC Vive Pro. The Vive Pro enhances everything inside the original headset. It has a higher resolution (2880 x 1600). To phrase it a different way, the HTC Vive Pro can now display 615 dpi, which is a 78% increase over the current-gen Vive. If the numbers aren’t painting a clear enough picture for you, all these extra pixels translate to a cleaner view and nearly screen door effect-free gameplay. The new headset will make it easier to read small text in games and applications. Meanwhile, the addition of built-in headphones and extra boost in audio quality could help usher in real competitive shooters in VR. It doesn’t help that it’s lighter too. All together it might only be a half-step towards a completely new HTC Vive – but hey, even half steps forward are welcomed here. 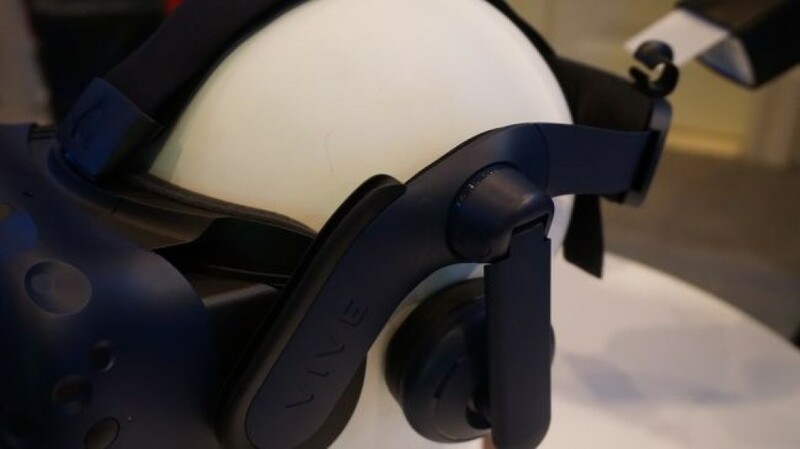 There will be new lighthouse sensors and controllers to go alongside the Vive Pro but, if the thought of a new headset setup scares you, you should know that the Vive Pro will be sold outside of a bundle and will be compatible with all HTC Vive 1.0 hardware. While the HTC Vive Pro isn’t a radical departure from the original Vive’s design, there are some subtle differences to the trained eye. The first, and most subtle difference, is the color. The original Vive is best described as a light grey. The sequel, the HTC Vive Pro, is a dark grayish blue. It’s so subtle a shift, though, that you might not be able to notice it unless you looked at them both in-person in a brightly lit room. The other major distinction, aesthetically at least, is the second front-facing camera lens. We spoke at length to several HTC employees about the additional camera, all of whom declined to comment on its purpose. They alluded to another announcement in the future, perhaps around the time pricing and availability is locked down. 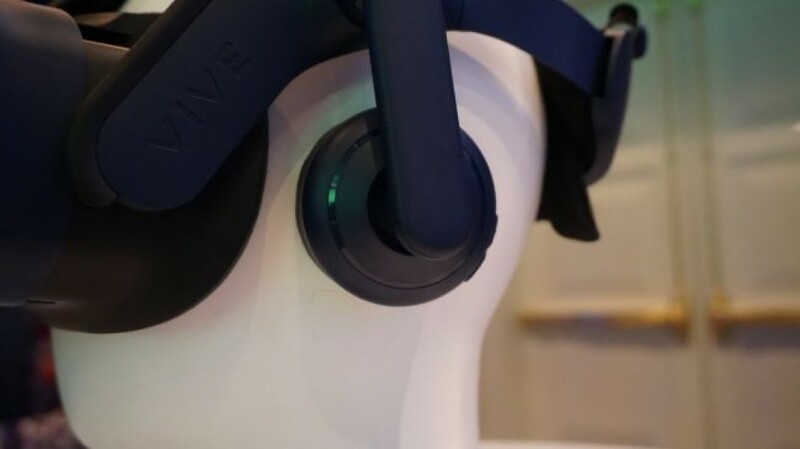 Moving from the front of the Vive Pro to the sides, you’ll see the second enhancement, the new headphones. They look an awful lot like the Vive Deluxe Audio Strap, which wouldn’t be a bad thing should they turn out to be exactly the same. While the original offered the freedom of using your own headphones, it’s nice to finally see an integrated option. Along the back of the headband is a twist knob that helps keep the headset snugly on your head. Wires still run from the back of the headset to the PC – for now – but HTC does have a solution called the HTC Wireless Adapter that could eliminate that problem in the future. So what’s one to make of all these upgrades? Well, after using it for a round or two of Evasion, a new Destiny-esque shooter from the Montreal-based studio Archiact, I walked away feeling better than I ever have about my favorite VR headset. While the numbers tell a better story than I ever could, images on the 2880 x 1600 screen looks crisp. It was still possible to see the faint outlines of each individual pixel, but it became even easier to forget that the landscapes I saw were completely non-existent in real life. It’s easy to point to the landscape because I think it’s here where most people focus when in the world of VR. Sure, you’ll spend copious time looking at enemies in shooting games, but it’s the environment that allows us to fully immerse ourselves in VR. It’s always easier to point at the environments because that’s where higher-resolution assets already exist. Enemies – or worse, effects like flames or explosions – never seem to receive the same attention to detail and thanks to the increased resolution somehow make the experience less real now that we can more clearly see roughly hewn textures. The best part of the demo was the lag … or rather the absolute absence of it. One would think that a higher-resolution headset running on the same hardware would create judder or, at the very least, periodic slowdown. But it didn’t. It was something you could notice while using the HTC Wireless Adapter (which I’ll go into detail elsewhere) but when wired to a gaming PC the HTC Vive Pro still performed exactly as you’d expect. The HTC Vive Pro isn’t a massive step forward for the Vive. It’s not the Vive 2 … as much as we’d like it to fulfill that role. To that end, it offers minor improvements upon the original. 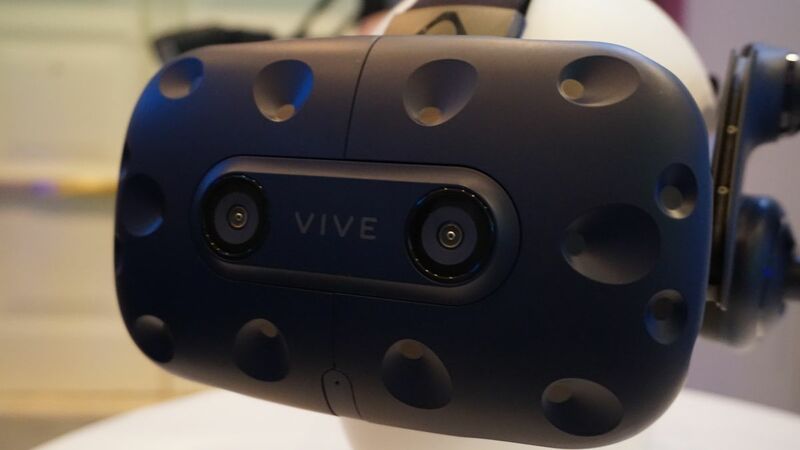 The enhanced resolution makes games feel more immersive, and the inclusion of a built-in headset help the Vive shake that DIY feel that the original had. Depending on the price it could be the half-step upgrade Vive needs to stay ahead of Rift – and, if nothing else, should keep the most discerning gamers tied over until the hardware leaps forward next generation.